On 1st December, 2017 The Caribbean Industrial Research Institute (CARIRI) and Microsoft Trinidad and Tobago formalized a partnership agreement which cements the relationship between the two organizations. In 2014, CARIRI and Microsoft opened the 116th Microsoft Innovation Centre in the world at Innovation Avenue, Freeport and the signing of this new agreement will see the continuation of this collaboration. 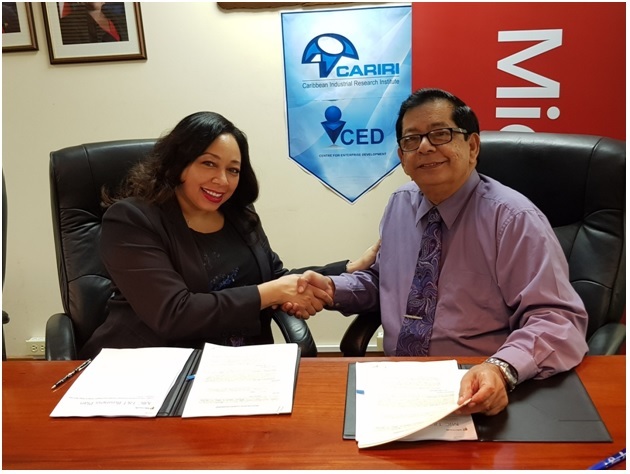 Signing the agreement is the new Country Head of Microsoft Trinidad and Tobago, Ms Racquel Moses as well Chief Executive Officer of CARIRI, Mr Liaquat Ali Shah. Both parties expressed their delight at this development and expressed their commitment to working together on future projects. The Microsoft Innovation Centre (MIC) has been assisting developers, independent software vendors, entrepreneurs, researchers and students to develop and deploy innovative software solutions based on Microsoft technology. During the past three (3) years, over four hundred (400) persons have benefitted from a wide range of Information Communication Technology (ICT) training courses, workshops and competitions at the MIC, while several have taken part in the MIC Incubatee Program as well as individual ICT and business mentorship sessions. The services provided are designed to boost ICT development and foster the growth of a sustainable local software industry, through skills and professional training, industry partnerships and innovation. Some of the stated objectives of the MIC are to focus on its Technical Incubator, which assists developers to achieve proof of concept; to have more training sessions, both developer-based and business-based and there is the intention to have more competitions to encourage the developer community to continue to expand. CARIRI is cognizant of the critical importance of networks and networking in the Innovation process and is open to working with key stakeholders, such as Public sector organizations, Universities, Private sector companies/organizations, Research and Technology Organizations (local and foreign) and Regional and International Organizations, to advance the national Innovation agenda. CARIRI and its Centre for Enterprise Development (CED), based in Freeport, are in a unique position to contribute to the overall development of the nation and are committed to ensure that the right partnerships are formed to further economic and social growth.